The Negley Awards are a series of cash grants presented annually to provider organizations who demonstrate excellence in risk management practices. They recognize outstanding achievements in risk management by behavioral healthcare organizations and offer the opportunity for the winners to share their risk management strategies with the whole of the mental health community. The winning organizations are selected from the applications reviewed by the Board of Directors of the Mental Health Risk Retention Group. Since the Award programs inception, more than one-quarter of a million dollars has been awarded to outstanding behavioral healthcare organizations that reduce risk to clients, staff and community. The Mental Health Risk Retention Group is now providing a Risk Management Hotline service to its insureds. 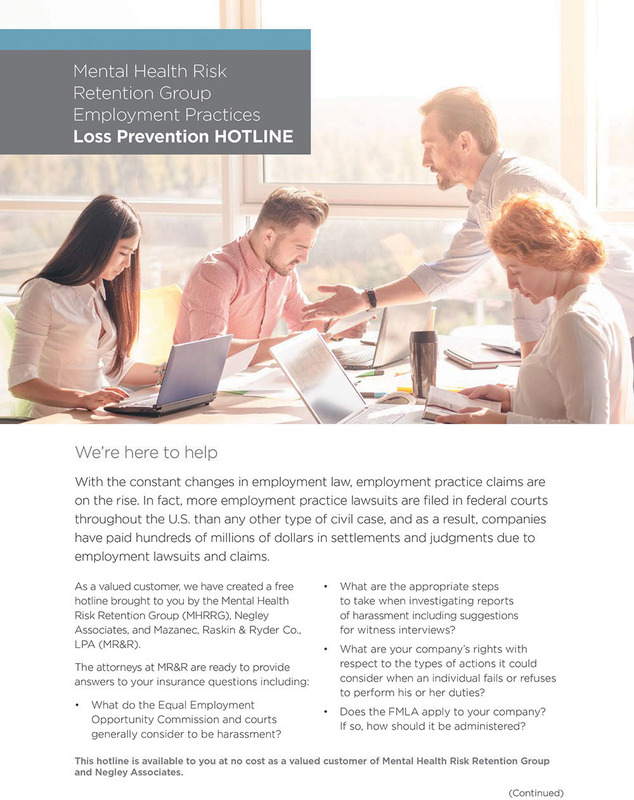 The intent of the hotline is to answer your General and Professional Liability Questions regarding how you can prevent liability claims from occurring at your center. Ronald K. Zimmet, General Counsel for MHRRG and an expert in this field, is available to answer your questions. If you would like to discuss something with Ron, please call Marilyn Udis at 800-845-1209 or e-mail mudis@jjnegley.com. This hotline is available to you free of charge. Brought to you by Scottsdale Insurance Company, Negley Associates, and Mazanec, Raskin, Ryder & Keller Co., LPA. As part of MHRRG's loss prevention program, Ron Zimmet, our corporate attorney, has prepared case studies based on actual claims. The case studies include recommended protocol and procedures and have been produced on CD. MHRRG's Corporate Counsel has provided 5 minute loss prevention videos on various topics.